I read this article and found it very interesting, thought it might be something for you. The article is called Italian Dressing-Inspired Roasted Broccoli (And a Giveaway!) and is located at https://www.anediblemosaic.com/italian-dressing-inspired-roasted-broccoli-and-a-giveaway/. If you take a look in my fridge at any given time and you’ll likely find about 30 different condiments. (I’m a condiment girl through and through!) I enjoy making my own salad dressing (this one is my favorite, but my everyday staple is olive oil, lemon juice, a little fresh grated garlic, and a pinch of salt, pepper, and dried mint…or if I want a sweet dressing olive oil, apple cider vinegar, honey, and a touch of Dijon), but I can definitely appreciate a good quality bottled dressing. And I’ve come to realize that bottled salad dressings have so many uses beyond just dressing salads. Last year I used Girard’s delicious Peach Mimosa Vinaigrette to make Stone Fruit Salad Canapés. Recently, the kind people at Girard’s invited me to become a Girard’s Epicurian Expert (thank you, Girard’s! ), and sent me a few other salad dressing flavors to try (Light Champagne, Olde Venice Italian, White Balsamic Vinaigrette, and Greek Feta Vinaigrette). I decided I wanted to again use them in something other than a salad. Italian dressing (along with Ranch!) was my favorite as a kid, and since it’s been so long I’ve had it, I decided to give it a try. I had some broccoli in my fridge and one of my favorite ways to prepare broccoli is roasting…all I really did was use Italian dressing instead of oil when I roasted it, and then top it with a few extra goodies like Parmigiano-Reggiano and that breadcrumb topping I love. It was delicious! The dressing really has great flavor. I served the broccoli with grilled chicken (also marinated in Italian dressing) and a garlic-y cannellini bean puree. The next day I had the leftover broccoli for lunch on top of the bean puree, which made a fantastic vegetarian meal. Preheat oven to 425F; line a baking sheet with parchment paper or a silpat liner. Toss the broccoli with the Italian dressing and a pinch of salt and pepper; arrange it in a single layer on the baking sheet and roast until golden brown in spots, about 12 minutes, stirring once halfway through cooking. Transfer to a serving platter and top with the breadcrumb topping and cheese shavings, if desired. In a small skillet, heat the olive oil over medium heat; add the onion and sauté until tender and just starting to brown (about 3 minutes), stirring occasionally. Turn the heat down to low and add the garlic and bread crumbs; sauté until the garlic is fragrant and the breadcrumbs are light golden brown (about 2 minutes), stirring frequently. Turn off heat and stir in the herbs and a pinch of salt and pepper. Cool completely. Served with lemon on top because Mike likes lemon on his broccoli. Lol, is that weird? I have to admit, it was actually a really tasty addition! Now for the giveaway! Girard’s was kind enough to offer another set of these delicious dressings to one lucky reader. The prize pack includes the following salad dressings: Light Champagne, Olde Venice Italian, White Balsamic Vinaigrette, and Greek Feta Vinaigrette. Leave a comment telling me which dressing you’re most excited to try. “Like” Faith’s Kitchen on Facebook and leave a comment letting me know. 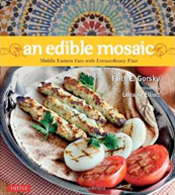 Follow An Edible Mosaic on Twitter and leave a comment letting me know. This giveaway ends September 13 at 9PM EST; after that the winner will be randomly selected and notified by email. Good luck to all! Disclaimer: I received this salad dressing for free from Girard’s and Girard’s is also providing one set of four dressings for this giveaway. As always, opinions stated are my own. This refined salad looks really good! A tasty combination. White Balsamic Vinaigrette is one of my favorite, Broccoli bread crumbs with Italian dressing, hummmm..sounds flavorful..
Have a great week, Faith! Their dressings are very good! Id be most excited to try the greek!! I never find bottled dressings that I like, so I always have to make my own. I have to try this one!! Great looking broccoli… delish! A really delicious and fuss free salad! I love the crumb topping… I’ll have to try it next time I make broccoli. Love everything in there, so delicious! The broccoli looks great :) I have been trying to “spice” up my broccoli making because it can get boring after awhile. These salad dressings look awesome. The Greek Feta Vinaigrette sounds amazing…yum! A few baby steps at the time…and you’ll soon be on the way to having the best marketing for your recipe book. What a tasty roasted salad! It is great to have some bottled dressing for convenience. Wonderful giveaway too! Your roasted broccoli looks great with the panko bread crumb. Love the combination of texture. That broccoli looks so good! What a great giveaway too! I’d like to try the White Balsamic Vinaigrette. I like Faith’s Kitchen on FB! Glad to see such a talented friend is also working with Girard’s. I just recently used it for my dish that I submitted to BC. I am a big fan of broccoli. This looks like a wonderful way to prepare it! Easy gourmet! Love it. I like to use Italian dressing on my green beans and peas, but haven’t tried broccoli yet–good idea! Your photos are wonderful–you’re a food artist. I like how you always do a whole setting for the photo instead of just the dish itself. Hm, the Old Venice Italian appeals to me mot out of those. We live off Italian dressing in our house! love that roasted broccoli very healthy. You’ve made humble broccoli tempting! I love using a honey mustard salad dressing in pasta salad with avo and capsicum – so easy. Yay on becoming a Girard’s Epicurian Expert, Faith! I love the combinations in your everyday staple dressing. Any dressing that has freshly graded garlic has my immediate attention. I would love to try the Light Champagne dressing. Thanks again for the opportunity, Faith. What a great way to literally dress up broccoli for a light end of summer dish. Yum!! The roasted broccoli with the crumbs on top is making me so hungry as I sit here still two hours away from lunchtime. It’s beautiful and inviting and so wholesome. I agree that it’s great to use gourmet salad dressing to kick up a meal. Nice Salad. . always looking for new things to do with my broccoli. I haven’t had Girard’s in ages but remember enjoying their dressings a lot. I’m curious about the Olde Venice Italian. Love the name and the idea. I wonder if I’ll feel like I’m sailing down the Grand Canal while having it on a crisp salad? Your roasted broccoli looks really good. I make something similar with garlic, oliv eoil and salt. Yum! The garlicky beans are wonderful too. You cook the way I like to eat, Faith. oooh, Girard’s is a new salad dressing brand to me, never tried it. Light Champagne sounds tasty :) What a nice short cut using premade salad dressing (although like you I enjoy making my own whenever possible). Oh, I love the look of this dish Faith! What a great way to jazz up broccoli! White Balsamic Vinigrette sounds delicious! going to have to go with the Greek Feta. but sorry, still dragging my feet on the whole twitter thing. gotta draw a Luddite line somewhere! I won the last Girard’s giveaway, so I’ll let others win. LOVE their dressings those…such unique varieties and flavors! My ex’s mother loved to cook. She actually had a separate fridge for condiments!!! I thought it was the greatest luxury in the world. I am nearly as bad and my poor fridge, even with no fresh food in it, is 1/3 full of oils, fragile spices, mustards hot sauces… well you name it! Love them. Great recipe for dressing! They all sound good… But if I have to pick one I would say the White Balsamic Vinegarette. Like Faith’s Kitchen on FB. I am most interested in the feta cheese dressing–I know it must be wonderful! Maybe I need to read dates closer! Doesn’t matter–I still would’ve liked you on FB anyway!